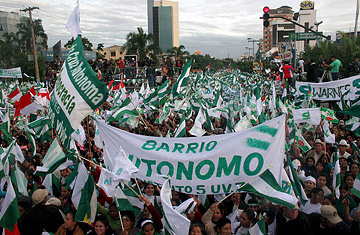 Thousands inhabitants of Bolivia's Santa Cruz department rally in support of increased autonomy from the central government. The department will hold a referendum on May 4. In his native Montana, Ronald Larsen's current legal straits might be the stuff of an old-fashioned Western movie: A cattle rancher who believes the government and its allies are unfairly trying to seize his land, and picks up a rifle to signal his displeasure. But in contemporary Bolivia, where Larsen makes his home, his recent clash with the authorities is but another instance of rising tension over land-ownership between, on the one hand, left-wing President Evo Morales and his supporters among Bolivia's indigenous population, and on the other, political opponents backed by the country's wealthy eastern elite. "A small group of ranchers is preventing us from carrying out rightful land reform in the eastern region of Santa Cruz," says Bolivia's Vice Minister of Land, Alejandro Almaraz, who accuses Larsen of attacking his convoy this spring. "U.S.-born Ronald Larsen is leading this violent resistance." But critics counter that Morales is hyping the case to build support ahead of Sunday's referendum in Santa Cruz, where opposition parties are pressing for autonomy from the central government  and ahead of a constitutional referendum later this year on changes that include capping the amount of land that can be owned by a single individual in Bolivia. Last month, when Almaraz and aides tried to pass through Larsen's Santa Cruz property  they insist it was the only route by which to reach to nearby indigenous Guarani residents to whom they were delivering land deeds  witnesses say the caravan was fired on by Larsen and his son Duston, 29. The incident was followed by two weeks of rancher roadblocks and violent protests that left 40 indigenous people injured. Larsen, who arrived in Bolivia in 1968, told a La Paz newspaper that Almaraz's vehicle had entered his property at around 3 a.m. Almaraz, he said, "had not presented any identification. He was drunk and being abusive ... I quieted him with a bullet to his tire. That's the story." But the government insists this wasn't Larsen's first run-in with Almaraz: the rancher is accused of kidnapping the vice minister for eight hours in February. The two alleged incidents prompted the government to file a criminal complaint of "sedition, robbery and other crimes" against Larsen and his son two weeks ago. Prosecutors have yet to decide whether to press formal charges. Neither father nor son has responded publicly to the accusations, and neither responded to repeated requests by TIME for comment. U.S.-educated Duston Larsen, referring to Morales' efforts to empower Bolivia's indigenous, wrote on his MySpace page in 2007, "I used to think democracy was the best form to govern a country but ... should a larger more uneducated group of people (70%) be in charge of making decisions, running a country and voting?" The fact that Duston, in 2004, won the Mr. Bolivia beauty pageant, in the eyes of many government supporters, puts him in the company of the country's European-oriented elite. (That same year, Miss Bolivia, Gabriela Oviedo, also from the country's east, suggested Bolivia shouldn't be considered an indigenous nation: "I'm from the other side of the country. We are tall, and we are white people, and we know English.") Morales backers say it is precisely this disdain for the indigenous that is driving what they call the secessionist agenda behind Sunday's autonomy referendum  which is not legally sanctioned by the National Electoral Court or recognized by the Organization of American States. But autonomy supporters say they're only seeking states' rights on questions such as taxation, police and public works. "This is a historic demand based on long-standing differences with a La Paz-based central government," says Edilberto Osinaga, managing director of the Chamber of Eastern Farmers. Autonomy is favored by more than the two-thirds of Santa Cruz voters needed to pass, according to polls, and Governor Ruben Costas, a staunch Morales opponent, said recently that it would "give birth to a new republic." He has since denied that he implied a separatist movement for Santa Cruz or the other three eastern states: Beni, Pando and Tarija, which will hold similar votes this summer. But critics say the remark betrayed an underlying goal of the country's eastern elite: gaining total control over Bolivia's vast natural gas reserves and its most fertile land. Conflict over land is also at the heart of the clash over a new draft constitution restricting an individual's land holdings to just under 25,000 acres  a profound challenge to the ownership pattern in a country where 10% of the population controls more than 90% of arable land. "This is an extremely problematic proposal," says Osinaga. "You impose those kinds of limits and watch how fast the economy crumbles and poverty grows."